5 good reasons to choose Aneia products for your child. When it comes to choosing something as important as your baby’s nutrition, there’s nothing like a recommendation from a trusted source. Whether it comes from your pediatrician, the hospital where your baby was born or another mom, it gives you the confidence that you’ve made the best choice for your baby. Why Aneia? Because Aneia Infant has DHA shown to foster learning ability from infancy through age 5. As a mom, you want to know the formula you give your baby helps nourish brain development now. But what if you could feel confident that when you feed your baby today, the effects of that nourishment could last for years? Recent clinical studies have been published that demonstrate infant formula fosters learning ability now -- and into the preschool and kindergarten years. These results are good news for moms who want to support the learning ability of their baby. *Study compared infants fed infant formula milk with 0.32% of total fatty acid as DHA vs discontinued formula milk without DHA; studied before the addition of prebiotics. † DCCS = Dimensional Change Card Sort. ‡ PPVT: Peabody Picture Vocabulary Test. DHA and ARA are two types of fatty acids babies get from their mothers during pregnancy. These nutrients are also found in breast milk. It’s been proven that DHA and ARA support brain development in the early months of life. Besides all the love and playtime you stimulate your baby with, nutrition also plays a critical role in brain development. Why Aneia? Because everything we do revolves around nourishing babies and children for happy homecomings. Bringing your baby home. Nothing in life compares to this special day and the days that follow. Holding him close as you get to know one another. Gazing into each other’s eyes. It’s what you’ve dreamed about for nine months. And you may be thinking about breastfeeding because few things compare to the intimacy of these nourishing moments. At Aneia, we understand just how important and fulfilling these moments are. And while we recognize that breast milk is an integral part of infant nutrition, we know that sometimes a mother needs other ways to nourish her child. So since the earliest days of our brand, we’ve dedicated our efforts to pediatric nutrition by developing safe, high-quality, innovative products that help nourish children, prenatally through toddlerhood. Nourishing your baby means the world to you. Now that you’re home together, the desire to nourish your newborn is pure maternal instinct. You may be intent on breastfeeding, since breast milk is commonly agreed to be the optimal source of nutrition and in fact recommended by the AAP for the first twelve months of life. That’s why we’ve studied breast milk extensively — to provide breast milk inspired products for your newborn as well as several supplements recommended by experts. After all, if you can enjoy the homecoming you’ve dreamed of, that’s a great start. Feeding options for every need, starting with your own breast milk. You should feed your baby in the way that’s best for both of you. That’s why Aneia also makes prenatal and breastfeeding supplements, like DHA to support your breastfeeding. If you choose to formula feed, you may choose a gentle formula for newborns, or one designed to complement breastfeeding. 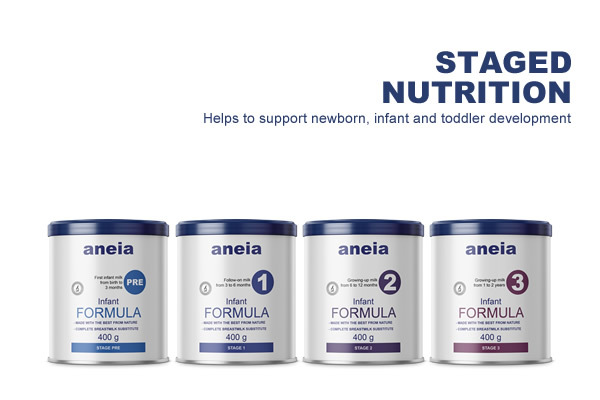 If you choose to formula feed exclusively, know that our Aneia Staged Nutrition formulas are inspired by the changing nutrition in breast milk, tailored to your baby’s age and all have brain-nourishing DHA. As a modern mom, you have more ways to confidently feed your child than ever before. The challenge no mother dreams about — a feeding issue. As much as you want to begin motherhood without any bumps in the road, there can be times when feeding doesn’t go as planned. Your baby’s digestive system is still developing. In fact, over half of moms report they experienced a feeding issue with their infant in the first year, so you’re not alone. 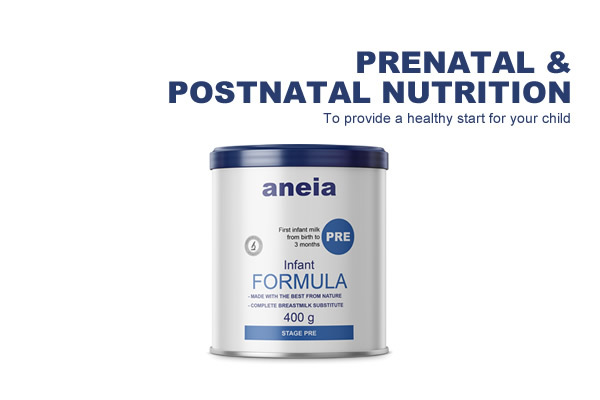 To help babies with developing digestive systems, Aneia has a range of specially designed formulas that help ease feeding issues. And each of these formulas has complete nutrition, so you can breathe a sigh of relief when your baby settles down with their help. 4. Why Do Mothers Choose Aneia? When it comes to making choices for your baby, you probably listen closely to the opinions of other moms. Because making a confident choice for your child’s nutrition is what it’s all about. After all, as long as you’ve researched and listened to moms you trust, you can feel good — knowing you’ve made a smart choice. During the first two years of life, a baby's brain develops rapidly and is especially sensitive to nutrition. That's why many experts believe it's important to get DHA during this critical time. DHA is a fatty acid that acts as a building block for a baby's brain. And Aneia has this brain-nourishing nutrition that is important to a baby's development. As your baby grows and develops, he reaches new and more complex milestones. These milestones are driven by cognitive, motor, social and communication areas of the brain. Aneia has DHA, a fatty acid recommended by experts and important for infant brain development. Your toddler's milestones are driven by the cognitive, motor, social and communication areas of the brain. Aneia has a tailored formula that includes DHA - important for the development that helps your toddler reach milestones. Aneia powder is specifically designed for toddlers 1-3 years to help ensure they get good nutrition for their changing needs and tastes. It has DHA and iron to support a growing brain, and probiotics, designed to help support your toddler's digestive system - along with 20 other nutrients. We offer an extensive variety of Formula Milk, Cereals, Baby Foods, Snacks, Yogurts, Meal Options, Sides, Beverages, Probiotics, Vitamins, Hygiene & Personal Care Products. Yes, I would to receive further information from Aneia such as expert advice or product samples. Please review frequently asked questions before contacting our customer service. Any questions on Aneia products? If so, please contact us in writing. We will be happy to help. Important notice: breastfeeding is the best for your baby. Formula Milk should be used as part of a mixed diet not as a breastmilk substitute before 6 months. Use on the advice of your healthcare professional.